Top: Illustration of bacteria drawn inward and forward by a light beam, creating an effective waveguide. Bottom left: Side view of a laser beam propagating in marine Synechococcus cells suspended in seawater, Aa low power and at high power. Bottom right: Corresponding 3-D plots of the beam profiles after 4 cm of propagation, captured by a CCD camera. The surprising existence of a significant nonlinear response in microorganisms, involving both robust self-trapping and enhanced transmission of a light beam through a biological suspension of marine bacteria, was recently demonstrated. 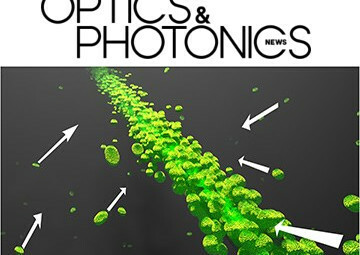 The bacteria formed actual optical waveguides while remaining alive and in good health,despite the high power required to manifest nonlinearity. The finding that cells can survive at high power levels and create waveguides promises interesting applications in medicine and biology. 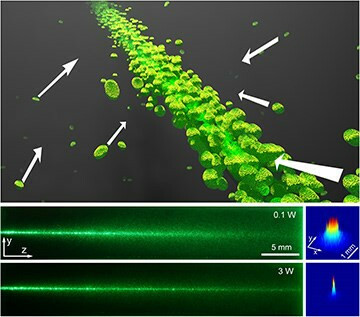 Bio-soft-matter systems with tunable optical nonlinearities, optical conduits in biological suspensions and the possibility of nonlinear imaging through biological fluids are only a few examples.